The new White Hot RX V-Line Fang, the latest from Odyssey. After last summer’s successful launch of the Odyssey Works line of putters, Callaway Golf followed up in late February with a new Odyssey White Hot RX series, along with additions to the Works line. With an insert that’s set a standard in feel for more than 15 years, the White Hot is part of a large family of flat sticks that accounts for the most putter wins on the Tour. The latest White Hots now have a dual layer injected molded insert that features a softer core, to help the ball get off to a pure roll faster, which helps the player control speed. 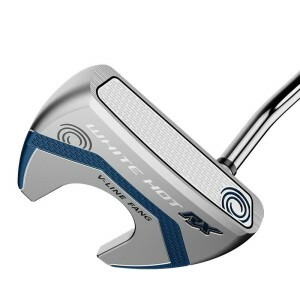 The oval pattern design in the putter face that created a quicker, better roll in the company’s Metal-X and Odyssey Works models is also in White Hot RX. What’s more, the company added a textured clear coat to the striking surface that works with oval roll technology to increase friction and help get the ball rolling faster. No company makes putters in more shapes and sizes than Odyssey. Indeed, the White Hot RX lineup includes the following head shapes: #1, #2, #7, #9, Rossie, 2-Ball V-Line, and the new V-Line Fang. The V-Line Fang combines the technologies and shaping of the Odyssey #7 model with the popular V-Line mallet for improved alignment and accuracy. These putters are also available in multiple grip options, including Odyssey’s standard rubber or SuperStroke grip options . The White Hot RX line starts at $159.99; $179.99 with Superstroke grips. The new Odyssey Works line extensions include the Fusion RX insert, along with some of Odyssey’s most innovative technologies and head shapes. The line extension includes: Odyssey Works Versa Marxman Fang, Odyssey Works Versa #7H Putter, Odyssey Works Versa Sabertooth, and Odyssey Works Versa Tank Sabertooth. The Marxman Fang provides stability and forgiveness from a Dual Fang Chassis that positions the clubhead’s weight to the perimeter to increase MOI. And the high-definition marxman alignment uses two alignment stripes to help golfers frame the ball and find the target line. 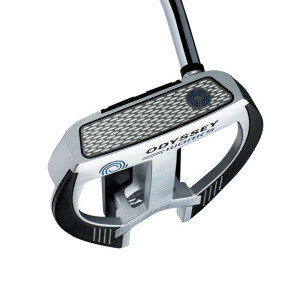 The new Odyssey Works putters start at $179.99. The Marxman Fang, part of the Odyssey Works line of putters. seen in the adjacent image, both of which are producing excellent putts.